Europe represents a tiny fraction of Canada’s wood exports, but that doesn’t mean the recently announced free trade agreement between Canada and the European Union won’t benefit the sector, especially in the long run. The Canada Wood Council noted that while 3% of Canadian wood exports are sold to Europe, most of those exports are higher grades of wood, representing 6% of the value of exports. The Canada-EU agreement will remove tariffs that currently average 1.2%. The Global Sawlog Price Index increased for the fourth consecutive quarter in the 2Q/13 to reach US$86.60/m3. The Index, which is based on sawlog prices in 20 regions around the world, has gone up 5.1 percent year-over-year and was at its highest level since the last quarter of 2011, according to the Wood Resource Quarterly. The largest log price increases the past year have been in regions that are exporting logs or lumber to China, including the Western US, Western Canada and New Zealand. Foreign lumberjacks are needed for the Prince George woods. Like the RCMP uniform was redesigned for women and Sikh members, and Hockey Night In Canada has a Punjabi language broadcast, now the iconic Mackinaw jacket and buckers’ pants outfit gets an international update. The reason for the need to outfit newcomers in plaid and visi-gear, said Central Interior Loggers Association executive director MaryAnne Arcand, is the lack of Canadians willing to sling a chainsaw over their shoulders or climb up into the cab of a tree processor. VANCOUVER — When Canadian forest company executive Wayne Guthrie visited the interior Chinese province of Chongqing last April, he saw a face of China that is older than might be seen in coastal mega-cities such as Shanghai and Guangzhou. Thousands of people were still riding bicycles through teeming city streets; subways, trains and cars have yet to become major people-movers. And when he visited the rail yards, he saw train after train with boxcars full of green Russian lumber. Lumber exports to China are on track to surpass last year’s near-record $1.08 billion, and Japanese sales are rebounding as well, as British Columbia continues to push wood products up the value chain. By the end of August, the latest B.C. government figures available, the value of lumber exports to China had hit $899 million, 32-per-cent higher than the same period in 2012. B.C. has been on a decade-long effort to gain acceptance for its wood products in China, which has traditionally relied on concrete and steel in its residential building sector. B.C. businesses in China focus on urban clusters where growing numbers of affluent consumers live …B.C. companies like Canfor Corp. that are moving up the value chain with the wood products they sell in China are already focusing on city clusters, developing distribution systems to sell their products in the inland clusters. The province’s resource companies account for most of B.C.’s exports to China — $4.96 billion of $5.75 billion worth of exports B.C. sent to China in 2012 — but there is a growing trade in technology such as BioteQ’s recovery systems, other value-added goods, and even fruit and seafood, which is being sent by air freight and sea. A FORESTRY company which has had financial problems this year is renewing efforts at restarting operations on land it has leased from the city. YaoRun Wood Ltd., owned by Chinese interests, has new people on site and is preparing to move out logs worth an estimated $3 million which have been accumulating since spring. “We are going to buck those logs up into 5.9 metres and put them into containers and get them ready to ship to China. Then as soon as we ship it we will get the money from the bank,” said new operations manager Xinchen Sung. Forests: Does salvage logging in beetle-killed forests make economic sense for the Forest Service? FRISCO — A new Forest Service study confirms the conventional wisdom that, under current market conditions, salvage of beetle-killed timber in Colorado is not good for the agency’s bottom line. The researchers evaluated potential potential revenues from harvesting standing timber killed by mountain pine beetle across the western United States. Positive net revenues are possible in regions with strong timber markets, including along the West Coast and in the northern Rockies. GRAND JUNCTION, Colo.—Colorado officials are asking the U.S. Forest Service to expedite efforts to get timber sales and forest stewardship contracts back up and running following the government shutdown. U.S. Sen. Mark Udall, D-Colo., said timber products and biomass energy are essential to forest management and to reduce wildfire risks throughout Colorado. “Jobs are at stake,” Udall said in a statement. The U.S. Forest Service did not return a phone call seeking comment. FEDERAL WAY, WA — Timber giant Weyerhaeuser is said to be close to inking a deal for its home building unit. The company announced in June that it would look at all available options for Weyerhauser Real Estate Co., including a merger, sale or spin-off or to continue to hold and operate. The sale would allow Weyerhaeuser to focus on its core timber and paper business while moving the home building unit at a time when the housing market is rebounding. Production of wood pulp and pulp of fibrous materials in Russia during the period of January-August 2013 decreased by 7%, compared to the same period in 2012. and amounted to 4.8 million tons, according to data of the Federal State Statistics Service (Rosstat). Timber production has decreased by 1.5% – to 14.1 million cubic meters, while plywood, in contrast, has increased by 4% – up to 2.2 million cubic meters. The production of fiberboards declined by 9.6% – to 274 million sq. m.
The Canadian Concrete Masonry Producers Association (CCMPA) issued a press statement in September to address a contentious full-page ad they ran in the Toronto Star, which took aim at wood-constructed buildings. …“It’s primarily an issue of bad marketing,” said Residential Construction Council of Central Ontario Technical Council member Marshal Leslie, in an interview with the Daily Commercial News at the time. …“Our ad campaign isn’t designed to misinform, but to educate the consumer when buying so they have the right information to ask the right questions,” the release stated. HANGZHOU, CHINA – In a move to raise awareness about the value of B.C. wood-frame design and technology, the 2013 Forestry Asia Trade Mission delegates toured the Naked Stables retreat in the Province of Zhejiang, China. Naked Stables is a luxury wood-frame construction resort project in the hills of Moganshan, a 90-minute drive from the provincial capital of Hangzhou. The resort consists of 30 tree-top wood-frame villas and 40 hotel-style chalets; the villas were built using pre-fabricated “structural insulated panels” – panels made with wood and insulating styrofoam. The Canadian Institute of Forestry/Institut forestier du Canada (CIF-IFC) announced its 2013 national award recipients at a gala banquet held in Corner Brook, Newfoundland this week. Several hundred CIF-IFC members from across Canada were in attendance for the Institute’s 105th conference and annual general meeting. CIF-IFC President Michel Vallée presented the James M. Kitz Award to Mr. Jonathan Lok of Port McNeil, British Columbia. About 50 protesters from half a dozen conservation groups gathered Tuesday at Cathedral Grove, west of Parksville, to protest Island Timberlands’ expansion of logging operations into old-growth forests on Vancouver Island. Protesters from the Ancient Forest Alliance, the Port Alberni Watershed-Forest Alliance and several other groups unfurled a banner reading “Hands off old growth” and handed leaflets to visitors stopping at Cathedral Grove on Highway 4. Longtime environmental activist, Vicky Husband, talks about the state of forest management on the Island and the coast. A logger died Monday following a work accident north of Sayward. There are few details about the accident and the man’s name was not released as of Tuesday morning. Campbell River Search and Rescue were called to assist in extracting the injured man from a site located off the Peel Main logging road. Unfortunately, the logger succumbed to his injuries by the time members arrived. From the history of logging in Algonquin Park to current forest management practices, 37 students and teachers from across southern Ontario had the opportunity to get the behind the scenes tour of forestry in one of Ontario’s most popular parks. The students and teachers, participating in Forestry Connects – a program of the Ontario Forestry Association – spent three days in the field learning about the value of forestry to Algonquin Park and the surrounding communities. Wildfire detection technology hasn’t changed much in 200 years. Fires are detected only when people see them. Spotters sit in towers to look for signs of smoke and gather reports from public sightings of fires. Forest rangers fly over the reported locations of lightning strikes to look for flames. But by the time those signs are visible, it’s often too late to contain a blaze. With several record wildfire seasons already in the books, and climate change threatening to increase and intensify wildfires, researchers at the University of California, Berkeley are proposing to monitor the most fire-prone regions of the U.S. with a highly sensitive satellite. The city of Forest Grove owns roughly 4,200 acres of pristine forest and creeks located northwest of the Gales Creek community, from which it draws about half of the city’s annual water supply. Though the lands are normally closed to the public, once a year city staff organize a tour open to anyone in the community who wants to see the source of their drinking water…. In addition to providing drinking water to residents of Forest Grove and Gales Creek, the maintenance and thinning of watershed timber lands generated $950,480 for the city this fiscal year. A logging project in the Kootenai National Forest that won a federal district court challenge has been temporarily halted by the 9th U.S. Circuit Court of Appeals. The Alliance for the Wild Rockies won an injunction on the Grizzly timber sale Monday, arguing its appeal of the lower court ruling would be moot if the sale went forward. The Helena-based group claims the sale would damage grizzly bear habitat as well as Canada lynx and fisher around the Cabinet-Yaak region. Trees may turn golden for reasons that have nothing to do with the onset of autumn: Eucalyptus trees can hold grains of gold, potentially helping reveal buried treasure, scientists now find. Many plants root deep into the Earth, drawing up nutrients and minerals they need for life. Researchers hope this fact could one day help miners unearth gold, especially since discoveries of new deposits of the precious metal have dropped 45 percent over the last 10 years. 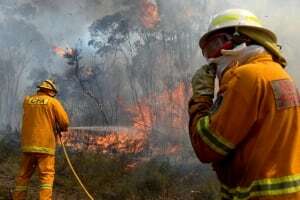 Firefighters battling dozens of wildfires in Australia’s most populous state merged two of the most worrying blazes on Tuesday to try to reduce the threat of a more unpredictable inferno taking hold. There had been fears that three of the fires near the Blue Mountains west of Sydney would join to create a massive, erratic wall of fire that would be difficult to control. So firefighters struck first, combining two of the fires into one that is easier to manage and contain. An invasive species of beetle that has killed tens of millions of ash trees in North America could “spread unhindered” across Europe, researchers have warned. 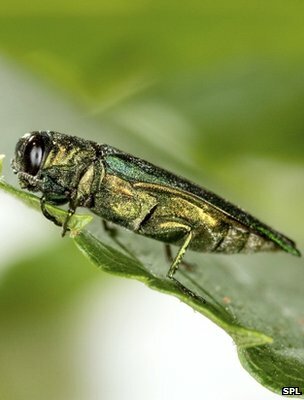 The emerald ash borer, first recorded in the Moscow area in 2007, has become established in surrounding broadleaved woodlands, they observed. The pest, which is expected to cost the US economy $10bn, has spread up to 25 miles each year, the team estimated. Aerial mapping company Bluesky International Ltd. said Monday it has completed the first detailed digital map of tree canopy cover across England and Wales. The tree map includes three individual map layers, detailing more than 280 million trees with a canopy cover of about 20,000 square kilometres – close to 13.5 percent of the country’s entire land cover, the Leicestershire, U.K.-based firm said. Work is also underway to create coverage for Scotland. Forests cover about half of Russia’s land mass, an environmental resource that President Vladimir Putin calls “the powerful green lungs of the planet.” But Putin himself acknowledges that Russia, the world’s biggest exporter of logs, is having its timber stolen at an unprecedented rate. The demand for high-value timber is fueling organized crime, government corruption and illegal logging in the Russian Far East. The hardwood cut in the endless forests often ends up as flooring and furniture in the United States, Europe, Japan and China. After more than a year of assessing the viability of a pellet plant for Lillooet and the surrounding area, the T’it’q’et Community says the assessment “looks promising.” In a news release from T’it’q’et’s P’egp’ig’lha Development Corporation (PDC), corporation chair Mike Leach said the proposed plant could produce 35 tonnes annually up to 100 tonnes, depending on the market. “The company is presently working on the possibility of locating a micro mill next to the plant which would produce cants and fibre for the plant,” the news release said. Finite Carbon and Norfolk Southern Corporation today announced the successful development and registration of the Brosnan Forest Improved Forest Management carbon project. The project meets the Climate Action Reserve’s forest project protocol and resulted in more than 282,000 eligible carbon offset credits at initial registration. The project is being transitioned as an early action project for the California Air Resources Board greenhouse gas emissions trading program. Carbon offset credits are issued for projects that significantly reduce greenhouse gas emissions.